Optimize your marketing dollars and drive more qualified leads to your business with our award-winning search marketing solution that combines proprietary technology with our marketing expertise. Ensure that your brand is visible across all major search engines and directories. 98%OUR NETWORK COVERS 98% OF PLACES PEOPLE SEARCH. Allocate your budget automatically to those keywords and publishers that drive the most conversions for your business. 2x YOUR BUDGET IS OPTIMIZED 2X UP TO TWICE DAILY. Ads created by our team have received the highest average Quality Score across their Channel Sales Partners. $$ BETTER QUALITY ADS CAN MEAN LOWER COST PER CLICK AND BETTER AD VISIBILITY. Leverage our marketing experts and proprietary technology to customize a marketing campaign that meets your specific business goals. Take advantage of our relationships with the largest search engines. We are recognized by Google, Yahoo! and Bing as utilizing best practices to maximize results for our clients. Ensure that your quality score is improved and maintained by working with our marketing experts. Through our understanding of search engine algorithms and factors that make up the scores, we can aid in keeping cost per click low. For the past 3 out of 4 years, we’ve received Google’s Quality Account Champion Awards. These awards are given to companies who produce “highly relevant” campaigns to the searches bid on and also help reduce the cost per lead for you. For over 10 years, we’ve helped countless businesses with establishing and improving their digital marketing. We currently manage almost 14,000campaigns annually for 12,000 clients. Advanced Optimization TechnologyEnlist our proprietary technology to optimize your campaign performance and maximize every marketing dollar. Up to two times a day, we will optimize your budget across all keywords and publishers and drive traffic to the top performers. Access Top Performing KeywordsLeverage our history of over one million search campaigns to uncover the keywords most pertinent for your business. By combining display and search ads, you can drive traffic locally through geo-targeting and brand awareness on a broader scale. Transparent ReportingView real-time data about your campaigns via web and mobile reports. Analyze site visits, calls, emails, form submissions and recordings of past calls to constantly evaluate your performance and look for areas of improvement. 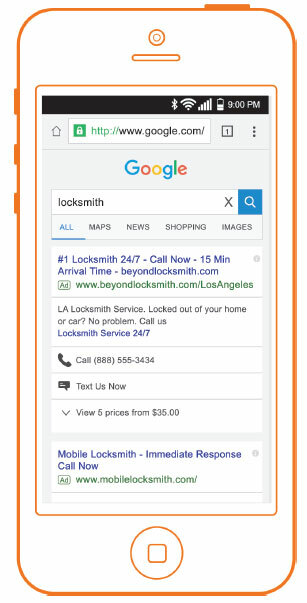 Mobile-Optimized ExperienceImprove your ability to reach consumers on the go by employing Google’s expanded text ad format that provides you with additional real estate to share your message. Additionally, incorporate calls to action, such as click to call or text directly within your ads to speed up the conversion process. Message Extensions and TotalLiveChatLet our chat agents manage incoming texts from your ads and prepare them for your follow up communications. Each text exchange is stored and cataloged with additional lead details in TotalLive- Chat software.